Scientific Study from the year 2007 in the subject Business economics - Operations Research, grade: 1,0, University of Southern California (Business Faculty), course: Strategic Management, 64 entries in the bibliography, language: English, abstract: The purpose of this report is to provide a Strategic Management Report with detailed strategic analyses of the dominant civil aircraft manufacturers Airbus and Boeing. The discussion main part of this report is separated into internal and external analyses, which are reasoned in greater detail and supported with reasonable graphs and tables in the attached Appendices. Finally, conclusions are drawn as to which is the more strategic savvy and which company has the more sustainable enterprise; and there is a recommendation given in which company a potential investor should rather invest in. Airbus and Boeing are having a neck-and-neck race in the aircraft industry for jets over 100 seats between Airbus and Boeing about the market leadership. After Airbus overtook its rival the first time in 2001 in terms of aircraft order and delivery, it stayed in front the last years until Boeing got back on top in 2006. The aircraft manufacturing industry is constantly growing, a global market and had a size of US$ 63 billion revenues in 2006. It is characterized by high entry barriers and investment in R&D and by a duopoly with Airbus and Boeing having a market share of 86% for aircrafts over 100 seats. 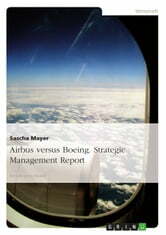 At the moment Airbus is in weaker financial position than its competitor. Boeing had an average year in 2006 with a moderate and good profitability, whereas Airbus is not in the red, but it is remarkable that the company had a bad year caused by the production and delivery problems with the A380, connecting with the delay compensations. In general, both Airbus and Boeing experience a strong support by the parent companies, whereas Boeing's outstanding and tightened military division strongly keeps the commercial airplane division on the ground and gives it an edge. In terms of product strategy the strength of the one is the weakness of the other: Boeing found no real answer on the A380 as mega-jumbo, but is highly successful with its B787 in the mid-size, long-range segment, where Airbus is lagging behind with its try to catch up through the A350. The market opportunities for both companies and strategies exist with increasing air traffic, especially in Asia with its upcoming markets China and India. On the other side increasing prices for raw materials or indirectly oil price fluctuations, and the risk of a new external shocks are threatening the performance.